Need to fuel your body? Here’s a recipe for an ancient grain that is said to have fed the Roman Legions! I discovered farro a few years ago at al di la Trattoria, a restaurant in Brooklyn, NY. The dish had a distinct nutty flavor with an al dente texture coated in flavorful olive oil. It was warm, comforting, and so delicious. The dish inspired me to explore new grains and to boldly go where I had never gone before…Are you bored of brown rice? Try Farro! It is a great source of slow-digesting, complex carbohydrates, providing a stable workout fuel for your body. No farro? No fear! This is a versatile recipe that works with whatever you have in your pantry and could even serve as a great addition to your Thanksgiving feast. Sharing is caring with this party portion recipe. Enjoy served warm or cold! Roast in the oven for about 30 minutes, or until cooked through. Rotate butternut squash once during cook time. Rotate Brussels sprouts from time to time for even browning. Meanwhile, heat a saucepan over medium heat and add broth and farro. Bring to a boil and reduce to low heat and cover for approximately 30 minutes until the liquid has evaporated. Whisk together balsamic vinegar, olive oil, and honey. Set aside. 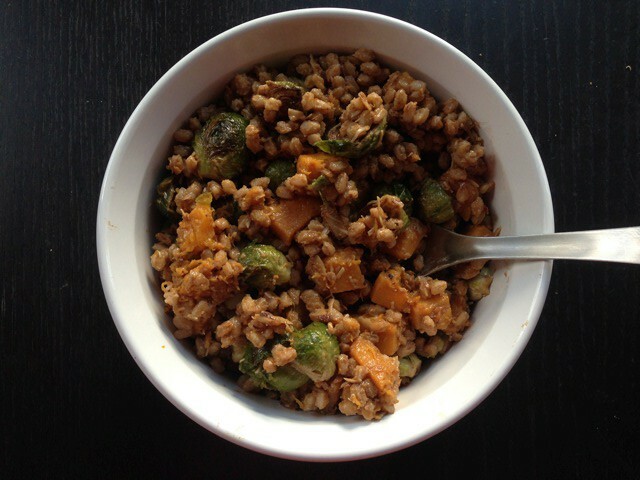 Combine farro, butternut squash, Brussels sprouts, sliced almonds, and Parmesan in a large bowl. Toss with the balsamic dressing and enjoy! Tanuja Kulkarni is a 2nd year FPAN/MPH student. In her spare time, she loves the challenge of pulling together recipes with whatever she has in the kitchen, cozying up with her dog and a good book.